Rugby has a fairly large following in Japan. A popular university sport, it was introduced to Japan in 1890 by Edward Clark, a Cambridge University instructor who taught English at Keio University in Tokyo and taught the sport as an extra curricular activity. Waseda University is the biggest name in Japanese rugby. It annual game against Keio University draws around 40,000 spectators. Waseda University has traditionally had Japan’s strongest university team. In January 2008, it won its 14th national collegiate title, defeating Keio 26-6. In January 2008, two former university rugby players were caught growing marijuana in their dormitory rooms. They were given 18 month prison sentences suspended for three years. The players played for collegiate rugby champions Kanto Gakuin University, which cancelled its season after the players were arrested, The coach was forced to quit. Tokyo hosted the Bledisloe Cup---a rugby match powerhouses New Zealand and Australia that has been held since 1931---in October 2009. The All Blacks won. Some All Black players (member of the famous New Zealand national team) have played in Japan after they retired. There has been some discussion of having Australia or New Zealand or teams from Australia or New Zealand play in Japan or starting a Japanese Super 14 franchise. In 2011, after the earthquake and tsunami, Sri Lanka refused to send its rugby team to a game scheduled to be played in July in Tokyo, four months after the disaster. The International Rugby Board pulled matches involving Tonga, Samoa and Fiji out of Japan. Rugby Sevens will come to Japan in 2012. The International Rugby Board announced in July 2011 the expansion of the HSBC Sevens World Series, with Tokyo being named the new host venue. The Japan leg will be played at Tokyo's Chichibunomiya Stadium, on the weekend of March 31-April 1, and comes a week after the iconic Hong Kong Sevens. The professional club rugby league in Japan is called the Top League. Launched in 2002, it is made up mostly of company teams. The championship final was known for a while as the Microsoft Cup. The season begins in October, and finishes with the All-Japan title game in March. The 14 teams in the 2011-2012 season were: 1) the Coca Cola West Red Sparks in Fukuoka; 2) the Fukuoka Sanix Blues in Fukuoka; 3) the Kintetsu Liners in Osaka; 4) the Kobe Steel Kobelco Steelers in Hyogo; 5) the NTT Docomo Red Hurricanes in Osaka; 6) the NEC Green Rockets in Chiba, near Tokyo; 7) the NTT Shining Arcs in Chiba; 8) the Ricoh Black Rams in Tokyo; 9) the Sanyo Wild Knights in Gunma, near Tokyo; 10) Suntory Sungoliath in Tokyo; 11) Toshiba Brave Lupus in Tokyo; 12) Toyota Verblitz in Aichi; 13) Honda Heat in Suzuka, Mie; and 14) Yamaha Jubilo in Shizuoka, Tokai. The All-Japan Rugby Championship is held in February and March. The finals are picked from the winners of matches between Japan’s top club and university teams. In the 2005 game Toyota Verblitz beat Toshiba Fuchu Brave Lupus. In March 2007, Suntory Sungoliath beat the Sanyo White Knights, The same two teams played each other in 2008. Suntory dominated possession and territory and would probably have beaten most other teams in Japan by a cricket score. So it was to the Wild Knights' credit that the game wasn't decided until the 69th minute, when Taira barged over for the decisive score. "I want to congratulate Panasonic, who played a very good game today," Suntory coach Eddie Jones said. "They were playing in their 10th final in a row, which is a real achievement. We really had to play well in the second half to win the game." The Sanyo Wild Knights defeated Suntory Sungoliatj 24-19 and defended its title in the All-Japan Championship in 2009. Toshiba pulled out of the tournament after winning its forth Top League crown after one its star payers, Tongan-born Christian Loamanu tested positive for cannabis and was suspended indefinitely from rugby. Earlier the coach of the team Tomohiro Segawam was blamed because one of the team’s low level players, 24-year-old Tongan Vivili Iongi, was arrested for stealing a bag containing ¥100,000 from a tax driver. The Japanese national rugby team is known as the Brave Blossoms. The team is currently coached by former All Black great John Kirwan. Among the members of the team are players with names like Webb, Robins, and Nicholas. As of November 2009, Japan was ranked 13th in the world. It has been able to beat teams like Canada, Italy and the United States. Japan does okay in Asia-wide competitions. It won the Asian Five Nations title in May 2008 with a victory over Hong Kong. The teams that competed were Japan, Hong Kong, South Korea, Kazakhstan, the Arabian Gulf. Japan also has competed on the Pacific Nations Cup. Japan has had few opportunities to play the world’s best teams. It has never played South Africa. It last played England in 1987 and has only played France twice. Some argue that its is pointless for Japan to play top-tiered teams because the games will only end in routes but others say Japan will never improve unless it plays the world’s best teams. In the 2010-11 season, each team was allowed to have three foreign players, up from two the previous season. Players from Fiji, Tonga, South Korea, China , Malaysia, the Philippines, Hong Kong and Thailand have played for Japanese club teams. The Japanese nation rugby team, made it to the 1987, 1991, 1995, 1999, 2003 and 2007 World Cup. It has played 20 games and won and tied only one game each. Its lone victory came in 1991 when it beat Zimbabwe 52-8 in Belfast. In 1995 in South Africa the Japanese lost 144 to 17 to New Zealand. Thus was a record loss until Australia beat Namibia 142-0 in 2003. The loss to New Zealand, some say, coupled with the emergence of the J. League, saw rugby fall way behind soccer in terms of popularity and playing numbers. At the 2003, World Cup Japan was beaten by Scotland 32-11, by France 51-29, by the United States 39-26. The best players on the team were New-Zealand-born flyhalf Andrew Miller and fellow kiwi George Konia. The American win over Japan was its first World Cup rugby victory since beating Japan in 1987. Japan lobbed very hard to get the 2011 World Cup for rugby, with form Japanese Prime Minister Mori heading the Japanese delegation, but lost in a close vote 11-10 to New Zealand. The Japanese thought they had the votes to secure the bid and blamed one Asian official for breaking his word and not supporting Japan. Many thought Japan would get the nod as part of an effort to broaden the fan base of rugby but in the end the old boy world of the elite rugby nations prevailed. Japan is on track to host the Rugby World Cup in either 2015 ro 2019 after its bid drew praise from the International Rugby Board in April 2009. The four other countries that bidding to host the event in 2015 are England, Australia, South Africa and Italy. Ireland, Scotland and Wales may join in England in its bid. Japan is said to be the front-runner to host the 2015 event. If it fails it is considered a shoo in for 2019. Japan hosted the Junior World Rugby Championship in June, 2009. Sixteen teams compete in the under-20 tournament with games in Tokyo, Osaka, Nagoya, Saga and Fukuoka from June 5-21. It performance hosting ths event was seen as an indicator of its ability to host the 2015 or 2019 Rugby World Cup. The latest attack on Japan claims it is OK for Polynesians to play for Australia and New Zealand--the argument being the players are following lines of migration that have been opened for centuries--but it is not OK for a new generation to open new lines of migration. "I don't know for sure but it seems to be a bit of a race thing," lock Luke Thompson told the Yomiuri Shimbun on the latest attack on Japan from an Australian-based journalist who called on the IRB to "limit the number of rugby mercenaries." "Look at the Wallabies," the 30-year-old said, pointing out that a number of their star players--Will Genia, Radike Samo, Quade Cooper, Digby Ioane and David Pocock--were all born outside Australia. "I have a Japanese passport and although I was born in another country [New Zealand] I can only play for Japan. I have lived in Japan for eight years and that's where my loyalties lie." Ryu Koliniasi Holani came to Japan at the age 15 on an academic scholarship. On arriving at high school he was asked, "What do you play?" "Trombone," was his response. "I hadn't played rugby until I got to Japan," Holani recalled. "I remember I used to get yellow carded every game because I didn't know the rules." Fourteen years later, Holani is not happy there are still some questioning whether he should play for the Land of the Rising Sun. "I am totally Japanese," he said. "It doesn't matter what the media says. All of the foreign-born players in the squad feel Japanese." Ryan Nicholas said having people in Japan question his right to play for the Brave Blossoms was disappointing, bearing in mind he has lived in Tokyo for seven years.As far as criticism from overseas was concerned, the 32-year-old center--who was born in Australia of Cook Island/Maori heritage and brought up in New Zealand--puts it down to ignorance. "A Pacific islander doesn't look out of place playing for New Zealand or an Argentine playing for Italy. But I guess the fact is I don't look Asian.I have shed a lot of blood and sweat for Japan and earned my right to play for them like anyone else. It's not an issue within the squad." At the Rugby World Cup in France in September 2007, Japan lost the opening game to Australia 91-3. It was only down 23-3 after the first half but collapsed in the second half as the players tired. Japan was also humiliated by Wales, losing to them 72-18 thanks to turnovers and missed tackles and again collapsing in the second half. In their last two game they made a respectable showing, losing to Fiji 35-31, going down in a tough fight, and coming with a last minute try and conversion to tie Canada 12-12 in their last game. Japan was ranked 18th in the world entering the tournament and was coached by John Kirwan, a former All-Black. The team was affected by decisions in which three non-Japanese players---a New Zealanders and two Australians--- that were earmarked to play to on the team were declared ineligible at the last minute. In May 2011, Japan secured a World Cup birth by routing Hong Kong 94-5. Japan dominated the HSBC Asian Five Nations rugby tournament, which was launched in 2007, and includes South Korea, Hong Kong, Kazakhstan and the Arabian Gulf in its top division. Japan came very close to winning the Pacific Cup in June 2010. They beat strong teams from Tonga and Samoa, the eventual winners, but lost early to Fiji. After the tournament Japan was ranked 12th in the world. In July 2009, Japan was selected to host the 2019 Rugby World Cup, beating out Italy and South Africa. “The God of rugby smiled on us today,” Japan Rugby Football Union President and former Japanese Prime Minister Yoshiro Mori said when the decision was announced. In the same meeting England got the nod to host the 2015 event. Japan’s hosting marks the first time the Rugby World Cup will be held in Asia and the first time it will be held outside a traditional rugby powerhouse. Some call the Rugby World Cup the world’s third largest sports event after the soccer World Cup and the Summer Olympics. Japan’s biggest challenge will be to raise the standards of its team by the time play begins. At the 2011 World Championships Japan was in a tough group with perennial favorites New Zealand’s All Black, France, tough Tonga and Canada, which were surprisingly strong in the competition. In the run up to the event Japan didn’t look too bad. It won the Pacific Nations Cup for the first time, in July, after defeating Fiji 24-13 with a controversial try in injury time. In it first game of the 2011 World Championships Japan gave former world champion France a run for their money before falling by the misleadingly lopsided score 47-21. France jumped off to early lead with a couple of quick tries but then Japan fought back from 25-11 to within four poinst with 20 minutes to go before France sealed victory with a couple more tris at the end. After the game the French scrum half Dimitri Yachvilli said, “We didn’t play that badly, because I think the Japanese will cause problems for a lot of teams. In the second game Japan was killed by New Zealand, 83-7. That game showed that Japan still had a long way to go if it wanted to play with big boys and win their respect. In the third game Japan was soundly beaten by Tonga 31-18. 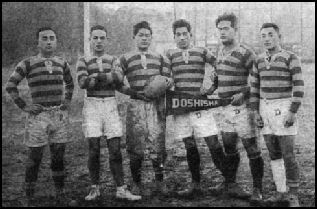 Rich Freeman wrote in the Daily Yomiuri, “The Brave Blossoms suffered a horrendous case of stage fright and shot themselves in the foot with mistake after mistake as they handed their do-or-die Pool A encounter to the Tongans on a plate. It was a game Japan should have won, as it led 17-7 at halftime and 23-15 with just six minutes left on the clock. But a couple of errors at key moments allowed the Canadians back into the game and ensured that Japan's long wait for a RWC win--its last and only one was in 1991--continues. "This is no good; we drew with them last time," said wing Hirotoki Onozawa. "It kills me that we weren't able to win. I had told myself not to get too emotional, but I did. I'm just so sorry for all the fans who have backed us." "I thought we had done enough to win it," said coach John Kirwan. "I am disappointed. I thought we had it." Kirwan doesn't like making excuses but he would have been justified if he had pointed at the RWC schedule as a cause for Japan failing to seal the win. The Brave Blossoms were playing their fourth game in 17 days, while the Canadians--playing their third game--were coming off an eight-day break. Former coach John Kirwan was criticized in some quarters for picking too many foreign-born players in his side. While Jones said he was under no restrictions as to who he could pick, he emphasized that he was looking at building a side around local players. "The color of the side will be Japanese," he said. "That's not to say I won't select foreign [born] players, but they are going to have to be good. At the moment there are three or four in the country that are good enough. They will definitely be selected as they will benefit the team. "But if there is a borderline choice between a young Japanese player and a foreign player, I will go with the player with the most potential and that will generally be the Japanese player." Jones said Japan has more potential than any other country in the world, based largely on the existence of the Top League. "Japan is one of the few countries with a domestic professional competition and that gives us a huge advantage," he said. "But we need to play 10 to 15 tests a year and play against sides better than us, so players can experience playing sides at a higher level." But "Club rugby is very different to test-match rugby," he said. "With Suntory we have a preseason of 33 weeks. With the national team it will be three weeks. The rugby is completely different. Philosophically, the way we need to attack will be based on skills, fitness and toughness. "The shape of the attack will be dependent on the quality of the players and the conditions we play in, but I guarantee we will try to play an attacking style of rugby." "It really is a case of now or never," said Englishman Keith Davies, who, between professional appointments in Europe and Australia, has been coaching high school, university and company sides in Japan for close to 30 years. "If they [the JRFU] don't make changes now and set in motion fundamental changes to the way the game is run here, then the 2019 Rugby World Cup [to be hosted by Japan] will be the biggest embarrassment in world rugby." Davies was recently part of the coaching setup of the Reds team that won the Super 15 title, an experience that highlighted for him one of the differences between Japan and the rest of the world. "The average age of the Reds team that won the title was 21, and that included Radike Samo who is 35," said Davies, who has coached over half the current Wallabies, either at the Reds or while they were in high school. "In Japan, players spend four years at university playing other university sides and it's a complete waste of time as far as their rugby development is concerned. At 22 they come out no better than they went in. The problem is the top officials won't admit it, because the decision makers all went to the same three or four universities and they don't want to give their power away. The university system is based on poor traditions, poor practices and poor training." "In my mind it's not that soccer is a better game. But look at the way it has put in foreign coaches at schools and established academies at the J.League clubs to ensure young players are getting good coaching and have a pathway to the top," he explained. "Coaching and sport should be all about development paths, skill and enjoyment." Davies said he watched a university game recently that was so bad he wrote to the JRFU to express his disgust. "It was shameful what Meiji did [against Tsukuba] and what they were allowed to do by the referee," he said. "For the last 20 minutes or so only the forwards touched the ball. Most of the time what they did was illegal but they were allowed to carry on and no one will stand up and say stop. It's no wonder Japan can't produce a flyhalf, as the Meiji No. 10 never touched the ball. "I challenge anyone to watch that game and tell me that is how rugby should be played and that this is how to attract young players to the game." Davies said one way to do this would be for properly qualified foreign development officers to be installed at the universities and for links to be set up between the colleges and companies. [Ibid] "That way there would be interaction between the colleges and clubs," he said. "And you would know the students were getting the right sort of instruction in terms of weight training and skill training on the field." Famous foreign rugby players, particularly from New Zealand and Australia, have earned good money at the of end of their careers playing in Japan. Among those who have come to Japan are George Gregan, a former coach of Australian national team who played for the Suntory Sungoliaths, and Stephen Larkham, a half back on the Australian national team. A number of All Black players have signed lucrative contracts to play in Japan after passing the peaks of their careers. These include 1.95-meter, 112-kilogram Brad Thorn who plays with the Fukuoka Sanix Blues. He joined the team in 2011 at the age of 36. He had 50 caps with New Zealand and played in the 2003 World Cup.